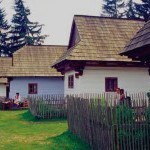 The most visited exhibition of the Museum of Liptov is the museum in nature. Apart from an exhibition of traditional lifestyle and work of various social classes in the region of Liptov, you can visit regular yearly programs, too. The exhibited objects come from many Liptov villages, mainly from areas which were flooded out by Liptovská Mara dam. These objects are copies of original buildings with many authentic features. Apart from wooden folk architecture, two original stone buildings from middle ages can be found here. It is an early-Gothic church from the village of Liptovská Mara and a Gothic-Renaissance mansion from the village of Parížovce. Exhibitions of traditional lifestyle in Liptov report e.g. housing of a landless, a peasant, a farmer, a craftsman or a mayor living here around the turn of the 19th and 20th century and in the first third of the 20th century. Attractive exhibitions of housing of the upper class of Liptov yeomanry are located in an yeoman curie from Paludza and in a mansion from Parížovce. The museum offers a cultural and educational project for pupils of elementary schools, kindergartens and families with children. The project is focused on nature and it is consists of two parts: an information spot and an educational path. The information spot has been set up in a cooperation with the National Park High Tatras. It is located in a house which contains 3D textual and photographic material about nature. The path is actually a maze of pathways with different surface structure – wooden material (bark, wooden chips, sawdust), natural material (moss, grass, needles) and geomorphological material (sand, gravel, alum, crushed stone, soil). The are several information panels and a brook with various types of crossings (bridge, footbridge, ford). An exhibition of the historical rolling stock of the Považská railway was opened up for public on 13 June, 2004. The railway ran from Liptovský Hrádok, through Liptovská Teplička up to Kráľova Hoľa between the first world war and the year 1972. Its second branch ran through valleys of the river Čierny Váh, almost to the boundary of the region of Horehronie. Another branch led to Malužiná. The tourist information centre of the National Park High Tatras was made available for public on 30 June, 2004. A ruined building, situated next to the mansion of Parížovce, had been reconstructed for this purpose. It presents the beauty and value of the nature in the National Park High Tatras. Another part of the exhibition shows the relations between men and nature throughout the history. The sponsorship of the Danish environmental assistance to Eastern Europe (DANCEE) helped to build the information centre. The exposition continues at the educational path, which is mainly intended for families with children.